The Picture Buyer. Etching 5 1/4 x 7. 1911. State 5/5. Ed. 100. Printing 85. Pencil signed, titled and inscribed 'Peters imp.' Morse 153. Laid paper. 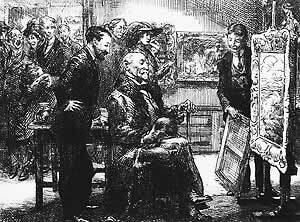 Here William Macbeth in his gallery hopes to make a sale. 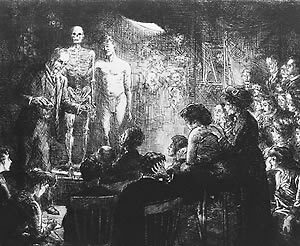 This print was exhibited in Armory Show, 1913 and was the only Sloan image sold. Anshutz on Anatomy. Etching 7 1/2 x 9. 1912. State 8/8. Ed. 100. Printing 80. Pencil signed, titled, noted 100 proofs and inscribed 'Peter Platt imp'. Morse 155. Wove paper. Exhibited at the Armory Show, 1913. Thomas Anshutz is delivering his guest lecture on anatomy in Robert Henri's class at the New York School of Art. Sloan, Henri and Glackens were students of Anshutz at the Pennsylvania Academy of the Fine Arts. Among those recognizable in the print are Robert and Linda Henri, George Bellows, Walter Pach, Rockwell Kent and John and Dolly Sloan. Snowstorm in the Village. Etching 7 x 5 . 1925. State 3/3. Ed. 100. Printing 100. Pencil signed, titled, noted 100 proofs and inscribed 'Chas. White imp.' Morse 216. Laid paper. 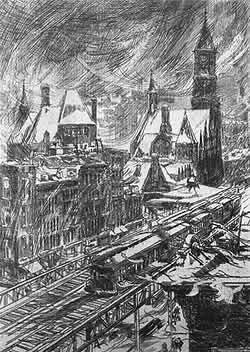 This view from Sloan's studio window shows the Jefferson Market Court tower and elevated tracks on Sixth Avenue during a swirling snowstorm. Subway Stairs. Etching. 7 x 5. 1926. State 7/7. Ed. 100. Printing 60. Pencil signed, titled, noted 100 proofs and inscribed 'Chas. White imp.' Morse 221. Wove paper. 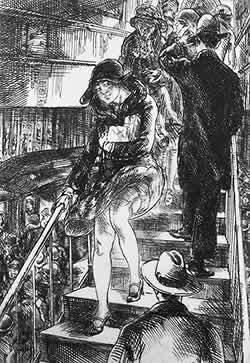 Sloan depicts in his humanistic and illustrative style the effect of a subway updraft on a full skirt.